When you live in a tree house, you don’t need an alarm because birds come knocking on the door to wake you up. Sounds like a line from a book, doesn’t it? It isn’t. When I finally fulfilled my dream of living in a tree house (read more about it here), I was literally woken up by chirping birds every morning. I have never loved rising early so much. 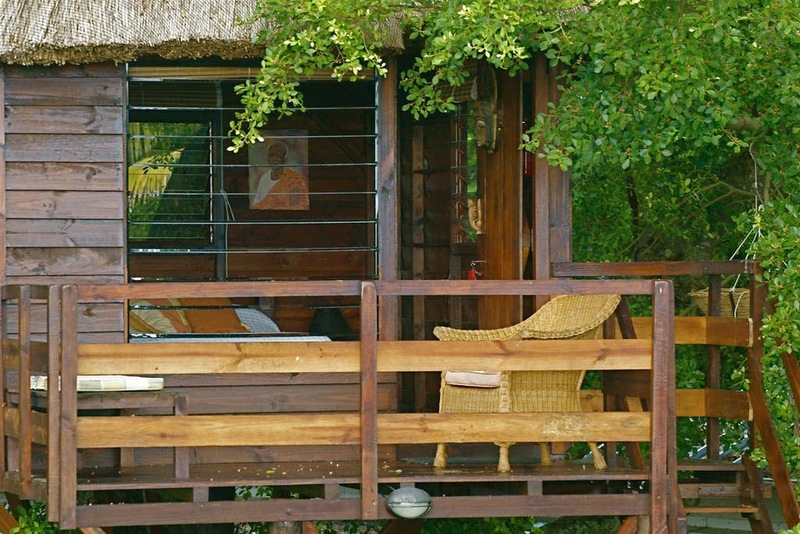 A spacious wooden room with a thatched roof and an outdoor sitting area cradled in a treetop—it was so cosy I didn’t want to leave. I found this gorgeous tree house in a nondescript bylane on the island of Mauritius via Airbnb. This tree house is situated in the backyard of the Cadets’ home. Benjamin Cadet, my kind host, built it himself. 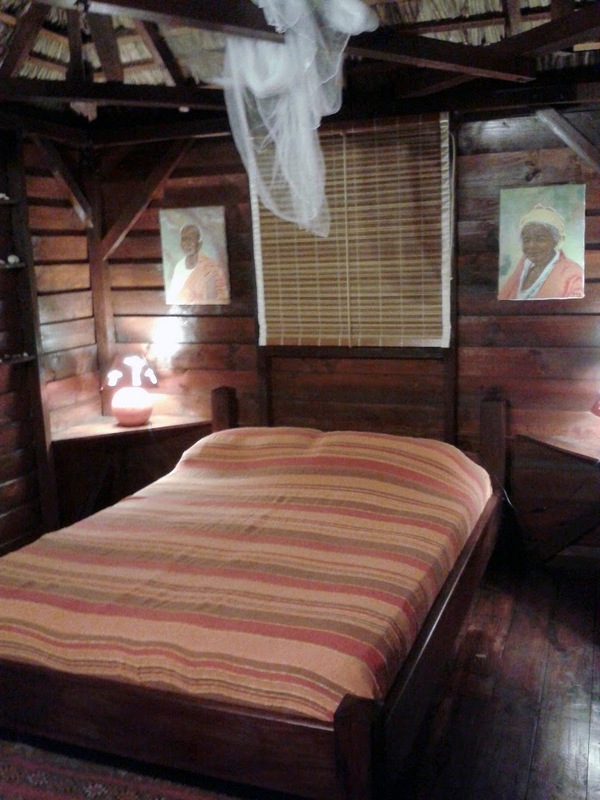 He built it for his children, but after they left the island to pursue their education in different countries, he and his wife Yannick put it up on Airbnb. A series of steps surrounded by leaves and vines take you up to an open-air seating area, where you can sit by viewing the sun rise and set with a hot cup of tea or coffee. The room’s door is adjacent to the seat and opens to a large bed that can easily fit two people. The bed is enveloped in a mosquito net as the surrounding tree invites many an insect into the room. There are four windows on all four walls of the room providing ample ventilation. The room also contains a mini fridge to store any drinks or eatables you may have; and a hot water kettle with a variety of teas and coffee to choose from. It also comes equipped with mosquito repellent to ward off any unsightly creatures! I for one detest insects, but I managed to stay here just fine. But first, I killed a few bugs that inevitably made their way into my room. The bathroom however is not located near the tree house. It is set up below; a few metres away from the stairs. 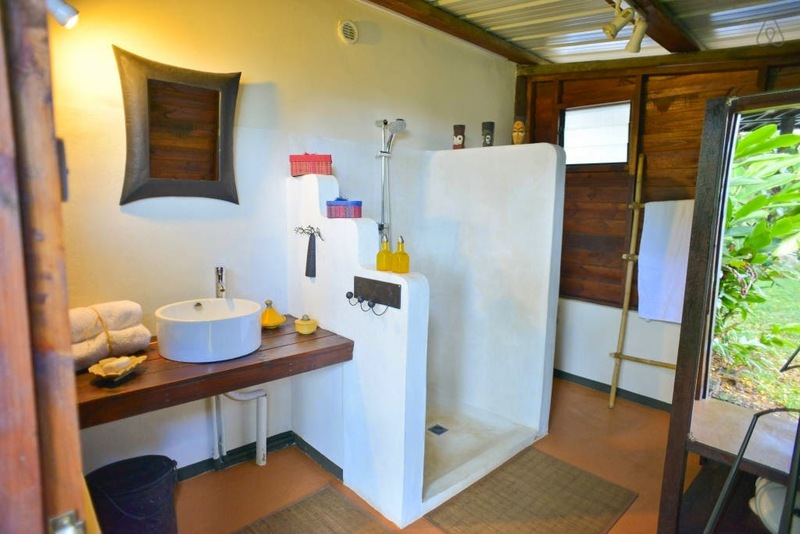 The bathroom is quite spacious and includes a bathing area, a toilet and a rack to keep your clothes on. There are hangers also available so it doubles up as a closet space too. The shower has both hot and cold water. There is also a swimming pool in the backyard that you can use. The cost of the tree house includes breakfast as well. It truly is a lavish meal. 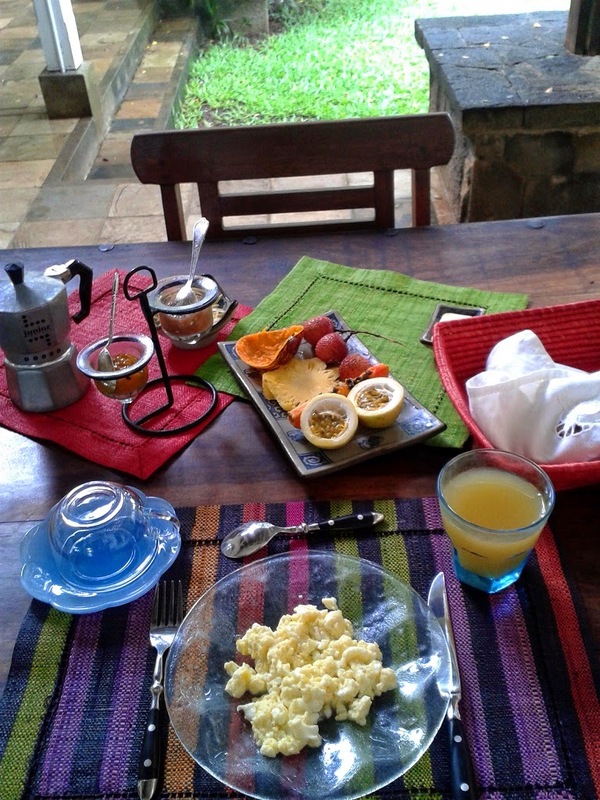 Hot coffee, juice, a variety of fruits, toasts with butter, cheese and homemade jam, and eggs prepared to your liking. Yannick goes out of her way to ensure you are fed well. For frequent internet users, there is free Wi-Fi on the property. You can also hang out in some areas of the home when you’re not spending time inside the tree house. I had the most amazing stay with the Cadets, so I am sharing in detail my experience and a little bit about my hosts. Ben is a scuba diving instructor by profession. He even met his wife Yannick during a dive. He began working back in the 1980s. From 1987 till 2006, he had eight diving centres in Mauritius. He then sold them off. But his contract stated that he couldn't open a diving centre in Mauritius for the next four years. So, he decided to take this opportunity to travel the world and learn new skills. He studied yachting in New Zealand, sailed the seas for years going back and forth from Cape Town and Australia, among other places, delivering boats. He returned home in 2010 and began diving again. Now he runs a smaller business, but ends up doing almost two to three dives a day. My stay with them was so humbling. They are such a kind couple. They welcomed me into their home like I was family. They even invited me to their family’s Christmas party. We drank, ate and danced together. 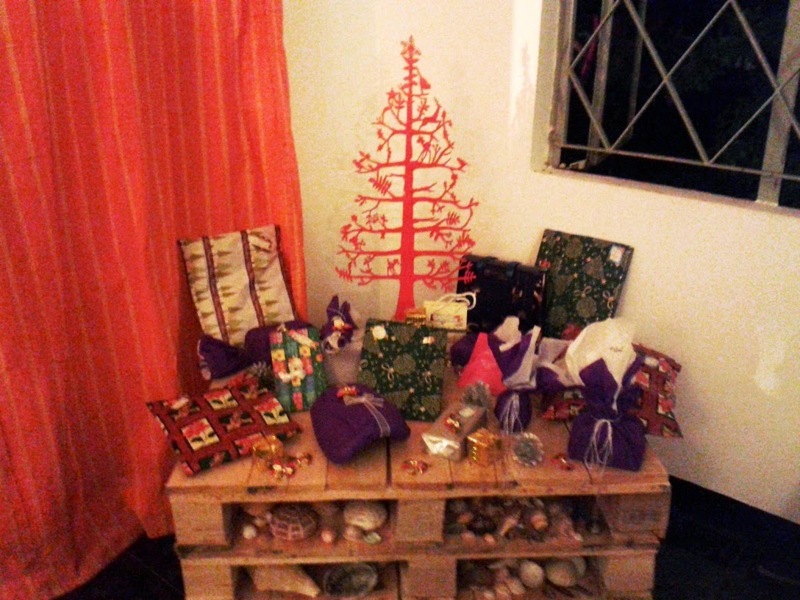 But the night became even more special when I found a gift with my name on it under the tree. I couldn’t believe it. 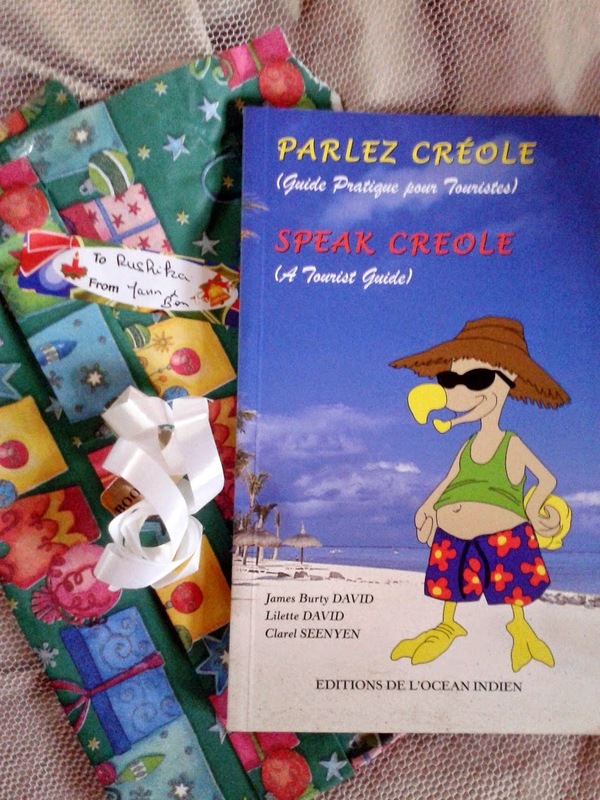 They bought me a book to learn Creole; the local language. I am so lucky to have met this happy couple. I would go back to Mauritius just to meet them again. The only drawback for me was that the house was not located close to a beach. By that I mean, not walking distance. And that is because I don’t drive and needed to use local transport to move around. But for those who drive, the nearest beach would be 15-20 minutes away. I realised that staying in a tree house is a unique experience that can only be savoured in a setting replete with greenery. So while it may not be close to a beach, it is more than worth it to live here. 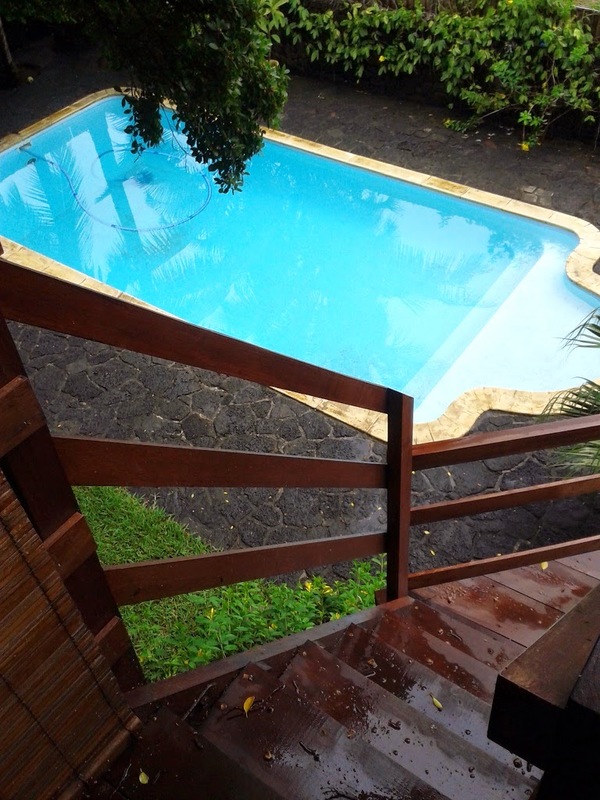 Click here to check out the property on Airbnb if you want to book it. I wouldn’t mind moving into a tree house if it looks this beautiful. However, I would have to ensure that the foundation is sturdy enough to accommodate a few more people because I love entertaining guests!